Spot silver XAG/USD is one of the best performing markets in our proven Forex Signals Program… Today we will share with you three of the most effective momentum based trading strategies for generating the best risk adjusted trading returns available in the silver market. 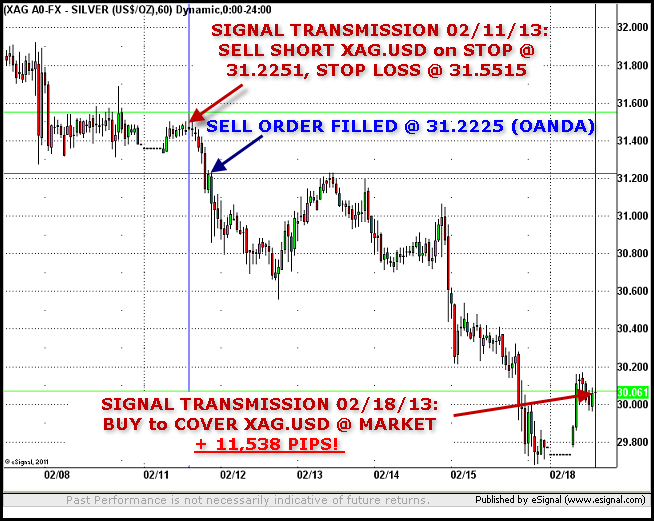 ‘The BIG money is in the BIG move’ and silver is a market that can move BIG! 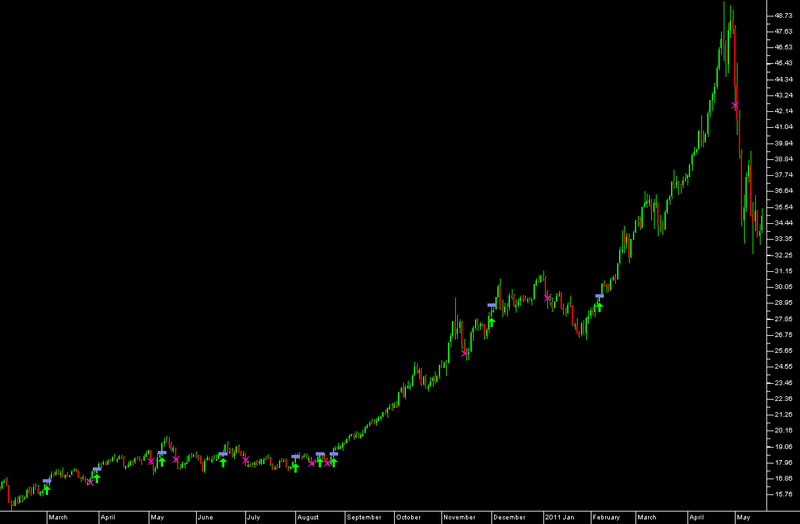 When a trend gets underway in Silver trend following systems can rack up some mouth openingly HUGE profits. Trend following systems capitalize by trading in the direction of the trend: cutting losses quickly whilst holding positions in the direction of the trend for as long as the trend lasts. This simple system trades breakouts within a 20 day high / low channel with a long / short trend filter: if the trend is up only long trades are taken / if the trend is down only short trades are taken. Note how losses are contained by our stop loss risk protection (to small percentages of our account) while the bulk of our gains are produced by a smaller number of MONSTER sized wins. Weekly Volatility Breakouts are an incredible methodology for capitalizing on volatility expansion off the Monday open. Big range weekly moves are often characterized by prices opening at their highs or lows for the week and closing at opposite extreme on Friday’s close. Weekly volatility breakout systems capitalize on this phenomenon by entering in the direction of the volatility expansion by a predefined volatility stretch off the early Monday morning opening price, therafter holding profitable positions for up to one week. 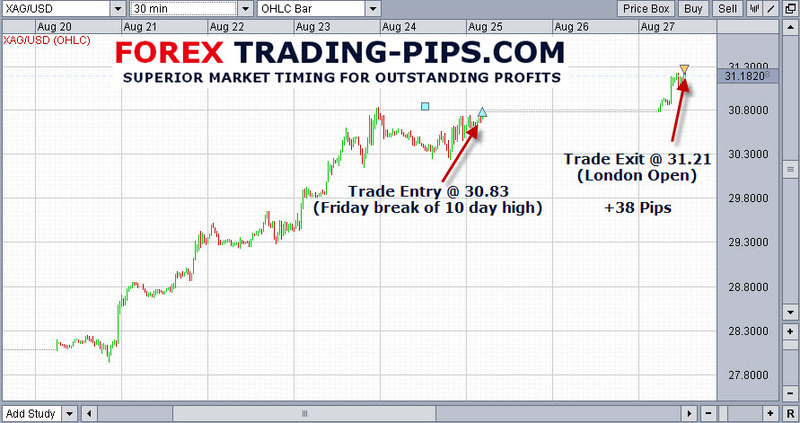 Friday breakouts taken in the direction of the underlying trend are one of the most robust breakout patterns tradeable. Traders are typically inclined to avoid holding risk over the weekend: by taking trades in the direction of the underlying trend held over the weekend period we are able to pick up a risk premium for doing so. Below is a chart showing recent Friday volatility breakout signals in our proven Forex Signals program which we transmitted live to our signals subscribers in real time.